On 18th May 2016 David Hill was joined by fifteen primary school teachers for a morning workshop on teaching and conducting young singers. It was an informal, interactive morning during which participants both discussed theory and practiced technique. It was important to us that the session was participant-led. Therefore, participants were asked about the aspects of their work they find most challenging, and David Hill offered exercises and techniques to improve skills and build confidence in those particular areas. During the group warm-up, teachers shared their favourite vocal exercises and games for the students to check out, building a large repertoire from which to draw in their own teaching. David Hill then took the teachers through some basic conducting moves, and illustrated the challenge of conducting music that keeps changing time using the example of “America” from Leonard Bernstein’s West Side Story. 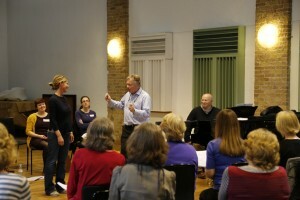 After a break, participants were given the opportunity to try their hand at conducting a selection of sopranos and altos from The Bach Choir with Phil Scriven on piano. Nine of the fifteen participants took the opportunity and conducted music they had requested and prepared. The chosen repertoire was varied, from classical choral numbers such as Mozart’s Ave Verum Corpus to songs from the shows. conveying the desired dynamic and expression. So many things a conductor has to do – each hand conveying something different!